Businesses and organisations which promote sustainable travel to employees or embed it within their business travel can enjoy real benefits. These can include financial savings; through reduced parking and money spent on company cars, as well as improved business efficiency and resilience. Encouraging cycling and walking can help your staff become fitter, healthier and more motivated. Regular cyclists, on average, take one sick day per annum less than non-cyclists and research has shown those who don’t drive have lower levels of stress. Promoting sustainable travel is also a good opportunity to contribute to your Corporate Social Responsibility agenda. It can help reduce problems such as parking on neighbouring streets or congestion in the local area and can help you with your environmental certification such as ISO14001. 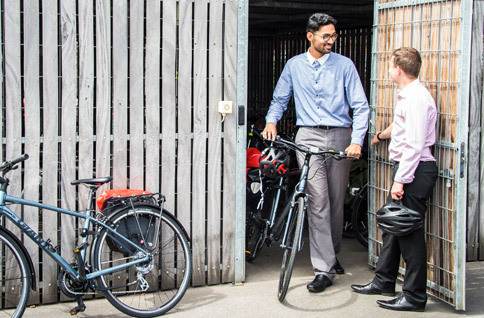 TfGM’s free business travel advice service encourages and supports organisations that promote walking, cycling, public transport, flexible working and car sharing to employees. Read our case studies to find out how businesses in Greater Manchester have benefted. Sign up to the Business Travel Network. There is also an accreditation scheme which awards businesses for their sustainable travel ambition.